According to the CDC, formal swim lessons can reduce the chance of drowning by as much as 88%. Since drowning is the leading cause of death for children aged one to four, an investment in swim lessons can help save lives. At Salem Swim, we’re excited to not only teach this important life saving skill, but also the joys of movement in the water that will last a lifetime. Our priority is to teach children to swim well, to love and respect the water. We are committed to providing swim lessons that build confidence and teach water skills in a child-centered environment. Warm water, warm air, a friendly staff, small student-teacher ratios (4:1) and a proven curriculum produce comfortable students who are ready to learn and thrive! There is no doubt the water provides a very special experience for young children. 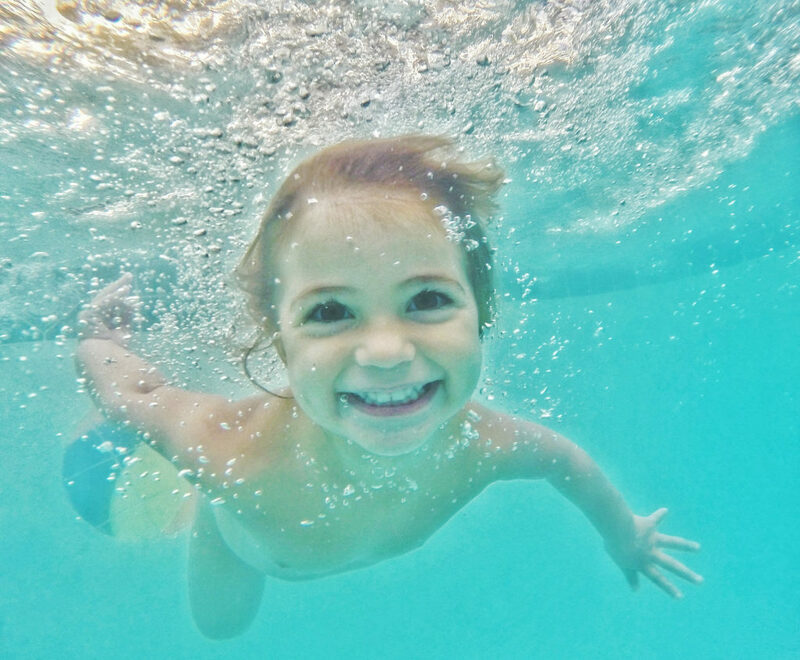 Babies often adapt to the water more readily than older children and can learn to swim at a very young age. The weightless environment of the water gives them a great place to exercise their young muscles while having fun and learning to swim. Additionally, researchers have now proven that early swimming lessons actually give children a head start in academics! Read more here. Salem Swim houses two warm water pools with state of the art filtration and sanitation systems to insure safe, clear water for our students and staff. The smaller pool is designed specifically for our youngest students, while the larger can accommodate several classes at once. The use of noodles, kickboards, mirrors, portable platforms and more mean each of our students can have an experience tailored to their needs. There are large viewing windows from the lobby to the pools, as well as exterior windows that provide both natural light and scenic views of the woods and pond. On deck showers and changing facilities are designed with families in mind. Learning to swim well is not a skill that you can learn in just a few quick lessons, but requires time to develop and practice. Salem Swim offers year round, 30-minute lessons allowing you to make swimming a regular part of your child’s weekly activities. This is the best way to encourage and maintain the water safety and fitness benefits that swimming offers your child. Baby swim lessons feature songs, games, and activities that help little ones learn to swim in a child centered environment. Our goal is to teach all of our students to truly LOVE THE WATER to the point that they could live in the water. Remember as a child feeling free and safe in the water? So many people do not. Some children are “water safe” but do what we call “panic swimming”. We want our students to feel balanced and comfortable in the water so that learning strokes is a natural and fun progression. In Baby & Me class, parents join their children in the water for class, making for great bonding time. Babies love the warm water environment and parents love the tools that encourage family fun safely in the water. Would you rather not be in the pool for lessons? Our private lessons give your baby one on one time with our patient and loving staff. In addition to time with us, we can show you appropriate games and activities for bath time that will reinforce the skills your little one is learning in the pool. CLICK BELOW TO VIEW OUR CLASS SCHEDULES AND REGISTER TODAY! This beginner class is designed to help your child become independently comfortable in the water without the use of “floaties”. As children learn to control their breath, balance in the water, and to calmly go under the water, they will lay the foundation to move confidently through our curriculum. In this advanced beginner class, students begin to move through the water by themselves, learn to float independently on both their front and back, to turn around by self and get back to the wall, and more. Prerequisite: Children must be comfortable in the water without floaties, be able to lie in the water on both their tummies and their backs with help (not floaties), and to comfortably go under the water by themselves. 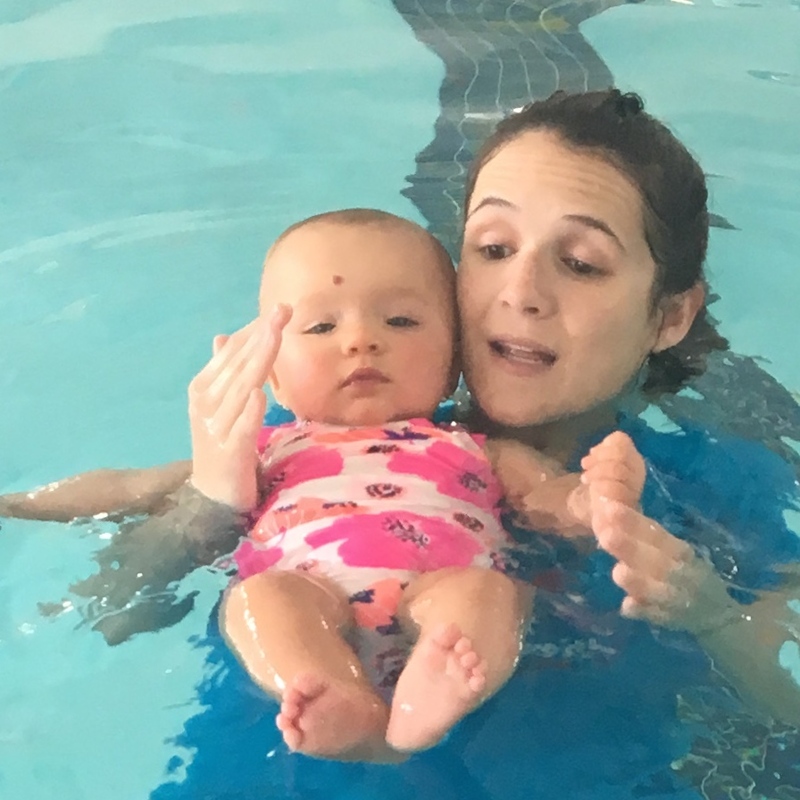 Students in this class will increase their independence and swim distance, retrieve objects from the bottom of the pool, and learn to roll over from swimming on their stomach to floating on their back; achieving an independent breath. Additionally, Level 3 students are introduced to other stroke techniques and kicks. Prerequisite: To be placed into this class, students must be able to calmly float on both their front and back, and to swim independently, calmly, and comfortably a distance of at least 5 feet. The cloth swim diaper must pass the “two-finger test”. If two fingers can be inserted under the elastic in the legs and waist, the swim diaper is too large and the child will not be permitted to enter the water. Both types of diapers are available for sale in our Front Office. In addition, please do not bring your child to class if he/she has had diarrhea within the past two days. Please review our Learn-to-Swim Class Policies for additional information. Our classes give toddlers a head start in fitness and social development. Give your child the physical foundation that leads to a confident future! Learning through FUN! Our program is designed to develop motor and social skills, laying the foundation for a lifetime of action!